- You marching towards 1st place continuously at music shows. Congrats for the 5 consecutive wins! SJ: We've just reorganized our team so I have much burden however I am glad that the public able to recognize our hard work. Besides that, I am always grateful to the members that protect Infinite. To be honest, this is most thankful thing I feel (to them). - Which part did you put in the most effort while making this album? SJ: I put in the most effort to my vocal. My part in "Tell Me" consider to have a pretty high pitch and has a lot of lines too. Since last time, I've been constantly taking vocal lesson and preparing for it. I worked hard to sing with my emotions rather than singing well just like a machine. SJ: Love? It's been a long time since I last dated. I rested for too long (laugh). I'm not sure what's the emotion of love. I would say its a bigger concern for me as compared to obsession. SJ: "Handsome Jjong", "Pretty Jjong", just like these, nicknames that end with "Jjong". Without realizing, I've grown up from 18 years old to now, 26 years old, I'm thankful for those fans that still calling me as "Jjongjjongie". - If there is a moment where you can really feel that Infinite is a 9-year big senior? SJ: It would be the time when we go on music shows. There are really a lot of junior idol group at their young age. We've been through that, we know better than anyone that it's really a hard period so whenver I met them, I'll greet and support them. It's good to see the juniors are working hard but most importantly, I hope that they are happy while they're promoting. - I heard that you're getting better in defending yourself from the Hyung's teasing towards maknae (the youngest). SJ: I've improved a lot. Now if they ask me "so what/how", I'll talk back by replying them "so like that". I think Hyungs like it more whenever I talk back to them (laugh). - Among the members, who is the one that teases Sung Jong the most? SJ: Sung Kyu hyung, Woo Hyunie hyung, Sung Yeolie hyung. That's the Top 3. Now I'll put it down and just think that "alright, as long as the Hyungs can laugh". If that's the endorphins to the Hyungs (laugh). 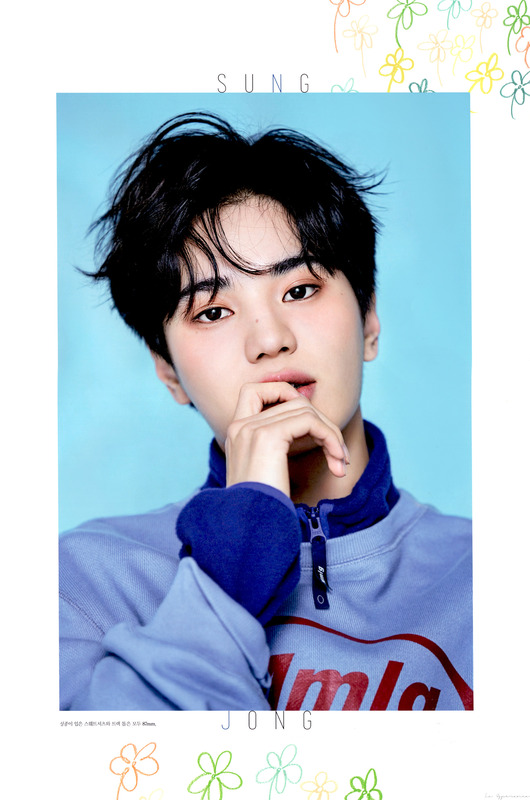 - Whenever you're having a hard time or a slump, if there's a Sung Jong's healing method to overcome it (what would be it)? SJ: I'll stay at home, sitting down at the sofa and enjoy a cup of tea while listening to music. I like herbal tea such as Camomile, Jasmine, Rooibos tea.